I really didn’t want to write about the Kavanaugh affair, but like the black hole lurking at the center of our Milky Way galaxy, it is impossible to escape. Ms. Ford’s flickering memory and her sisters of the victimized sorority of Kavanaugh’s targets of desire, each new one more outré than the last, are a compelling combination of reality TV and soap opera. How could we, as a nation, not be drawn into the drama? As a good part of the nation watched Mr. Kavanaugh and Ms. Ford testify before the Senate, we could not escape seeing the leaders of our nation, our wise men and women, in action. They did not come off well. It is human to look to the past as a time when things were better, a time when there were giants in the land. If we are honest, we know that we see our leaders in past times through rose colored glasses. But it is also true that history doesn’t grade on a curve. There is Winston Churchill – and there is Neville Chamberlain. There is Ronald Reagan – and there is Walter Mondale. During the recent televised circus it was difficult to escape the depth of our degraded circumstances as a nation, as a people. For weeks now, two human beings have been made to suffer and endure in front of preening senators, tabloid journalism and a voyeuristic national audience. These two human beings have been pulled out of their lives and forced to endure an intrusive grueling speculative inquisition of their behavior 35 years ago while under the influence of alcohol and in the grip of teenage hormones. Two human beings have been made the subject of crude humor and brutish speculative indecency. Anyone with even a modicum of decency should be overcome with shame once free of the emotional hysteria that has come over our political culture. This is not the first time that our political culture has gone off the rails because of overwrought fears. Even during the times of the Pilgrim forefathers, we had the Salem witch trials. 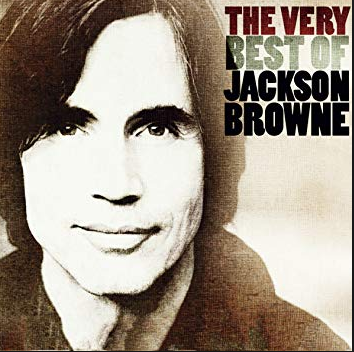 But it was not so long ago a time when fears of communist infiltration, of communist party members secretly aiding and abetting the overthrow of our government, excited the nation’s nerves into a frenzy. Then as now, ambitious politicians saw it as an opportunity. There is no question that the doyenne of the Senate, Diane Feinstein, lit the fuse on this piñata of emotional excess. The 85 year old Diane Feinstein faces an election this November, seeking her sixth term as Senator from California. But for the first time in her political career her opponent is not the usual milquetoast Republican lamb, after all – the last Republican elected Senator in California was Pete Wilson in 1983. Ms. Feinstein has been extraordinarily blessed in her opponents in previous elections. This time she faces Kevin Leon, a progressive activist and lifetime politician now going by the name of Kevin de Leon. Mr. de Leon is an American success story. We are proud of Kevin de Leon and those like him. Raised by a single mother from Guatemala, he is an example of the great American melting pot. But he is a de Leon now rather than just plain old Leon and he is a member of that group of people who give their occupation as activist. His politics and manner are well suited to the urban enclaves of the West Coast, but would be somewhat less electable elsewhere. But these are the things that make him a very dangerous opponent for Ms. Feinstein in California. 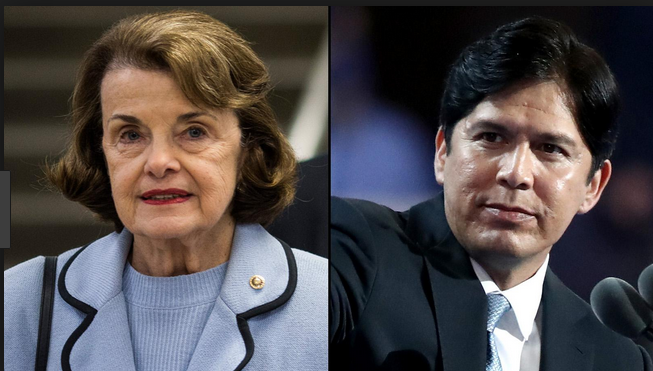 Ms. Feinstein’s own party, the Democrats, chose to endorse her opponent Kevin de Leon. Perhaps as Ms. Feinstein lies awake in her Bay Area mansion she contemplates how it is that a first generation young Latino dares to run against an old rich white woman who reaped the advantages to be gained from the Harvey Milk assassination all those long years ago in San Francisco. To paraphrase Christ’s words to Peter in the Garden of Gethsemane, “all who take up identity politics, will die by identity politics”. But evidently Ms. Feinstein is a woman of great ego and has decided to run again anyway. California’s interesting electoral system allows two Democrats to run for the same Senate seat, perhaps a very practical accommodation in the Golden State where Republicans have turned into an endangered species. Ms. Feinstein is a cagey old bird and understands the need for publicity. Her route to a seventh term in the Senate requires her to burnish her progressive credentials and to light the fires of righteous anger in California women. Given her college degree in History, one is left to wonder if Ms. Feinstein remembers Gaius Marius, known in his time as the First Man in Rome. Marius was another proud politician who ran for an unprecedented seventh consulship as an old man in a time of great public anxiety. Throwing custom and caution to the winds, Marius broke faith with the conventions of Roman politics, selfishly lighting fires of emotional hatred that could not be quenched. He won the election, but it turned out to be disastrous for both Gaius Marius and Rome. The gods always punish hubris. Back in the early Fifties, another senator, this one from Wisconsin, had presidential aspirations. The nation had just emerged from a brutal conflict in Korea with international communism. America was still coming to terms with the fact that a large part of Europe had escaped from Nazi Germany only to disappear again behind the Iron Curtain. The media was full of stories about the power of communist brainwashing. 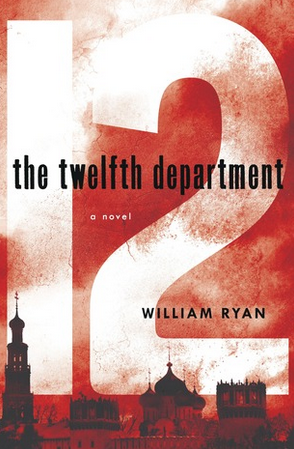 Russia now had nuclear weapons and seemed intent on extending her empire over the entire world. This Senator from Wisconsin, Tail Gunner Joe McCarthy, used Senate Committee hearings to accuse people of being communists. A blanket fear of communism covered much of the nation. No one knew who Senator McCarthy would accuse of being a hidden communist next. Teenage indiscretions, such as a youthful fling with communism, now had very serious consequences for people in important positions. Many important and influential people were ruined by accusations, often unproven, of youthful flirtations with communism. Even the beautiful people of Hollywood were not safe from Tail Gunner Joe McCarthy. In the 1950’s, we had Tail Gunner Joe McCarthy. Today we have Dianne Feinstein. We have always had opportunistic politicians. If you aren’t opportunistic and ambitious, you wouldn’t be a politician. But in the 1950’s there seemingly remained integrity in our culture, a sense of fair play, a honest respect for objective truth that seems lost today. Today integrity and fair play seem a quaint affectation of the past. Today we have the New York Times whose journalists comb high school yearbooks to prove that after decades of accomplishment and integrity, the man in question is incurably sexist, racist, misogynistic, etc. Back in the 1950’s, it was an unlikely man, Joseph Welch, who stood up to Tail Gunner Joe McCarthy. 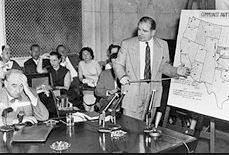 Joseph Welch was a lawyer testifying before the Senate while being questioned and hounded unmercifully by McCarthy. Welch’s quiet dignity in the face of great provocation, his honest answers that resisted responding to McCarthy’s innuendo impressed a nation as yet unjaded by the Kardashians and their ilk. So far we have not seen a Joseph Welch in the present travesty. But it was another man, a man of television news that we remember today. Edward R. Murrow was a great journalist who stands even taller when measured against our present generation. Perhaps there is a corollary to Sayles Law at work in the media. As you might remember, Sayles Law is the observation of an Elizabethan Era court official to the effect that – “Bad money drives out good”. One might assert a corollary saying “bad journalists drive out good”. There is certainly evidence for that assertion when we ponder the landscape of today’s journalism. Back in the day of Tail Gunner Joe McCarthy, Edward R. Murrow went on television and reminded Americans of their heritage, of the nation they were privileged to live in, of who they were as a people. Murrow’s words still resonate with power and emotion. Listening to him speak on YouTube chokes me up as it brings tears to my eyes. Fearful men – that phrase tolls like a single church bell ringing out judgment on my own generation. We are not descended from fearful men, but we have let ourselves be led by fearful men. The spectacle of the past few weeks leaves the world no doubt that our senators are fearful men – and fearful women. 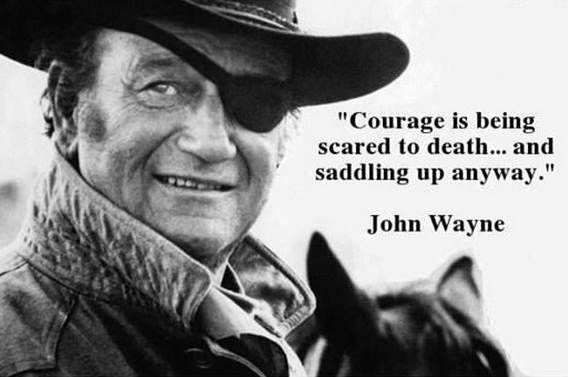 Perhaps the last senator of courage passed just a few weeks past. Even worse, we have become fearful men ourselves. When we look at ourselves, when we look at the leaders whom we elect, how can we not be humbled at our abject failure to measure up to those who came before? I’m sorry, ladies, but I grew up in a culture that excused women from conversations of courage thus I have no expectation of Ms Feinstein. Those who have pledged allegiance to the politics of identity must stay true to their faith. Mothers are lions in defense of their young and their family, but it was for men to be brave – to not shrink from duty in the face of fear. It was expected of boys and of men to be brave, not to seek confrontation but to stand firm when it came. While mothers believed us, showering us with unquestioned love no matter our failure, our fathers called us to stand up for the right and tell the truth. I listen to the words of Edward R. Murrow and I am broken for my country. I have a cheap tin plaque mounted in my garage where I can see it several times a day as I wander about in my dotage. It is an idealized sepia picture of “The Duke”, John Wayne. Written across the plaque is a quote attributed to him remembered many times in my life when hard things loomed on the horizon. I wish I could say that I have always met the test. Too many times I have found an excuse to remain in the corral, grooming my horse. 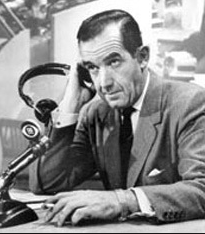 Edward R. Murrow could tell his audience to dig into “our history and our doctrine” in 1954, knowing that his audience would not only be inspired by what he said, but understand him as well. Mr. Murrow told us we must “we dig into our history and our doctrine”. How droll! In our own time, history has become the province of grievance. We now see our history as only a ready rationale for dividing up the pie of political favor and excusing existing cultural pathologies. We have only to listen to Ms. Feinstein’s opponent to see where such perspectives lead us, a balkanized land of aggrieved tribes seething with resentments. Our journalists dig into history only for proof that teenagers are indeed callow and in the grip of instinct. Doctrine! Are you kidding? Doctrine is the name for a truth we all acknowledge. But the only truth we acknowledge in these times and in this culture is our own truth. Accusation based on our truth is proof enough. Conviction needs no more than belief. 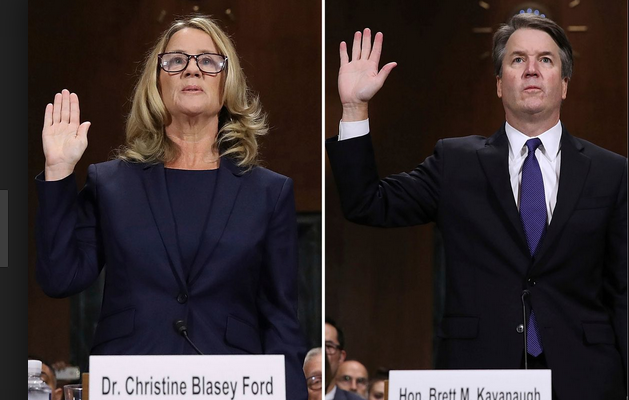 What is a more pointed testimony to our truth than the response of our wise men to Ms. Ford’s testimony? Her testimony before the committee was rich in subjective detail, emotionally compelling but devoid of facts. While clearly in the grip of belief, Ms. Ford’s memories of “the most traumatic event in her life” were simply her memories. Her testimony was remarkably empty of facts. But again and again she was congratulated for her bravery in speaking “her truth”. In parsing out the strategy of those who seek to derail Mr. Kavanaugh, I am reminded of the 7th chapter in the Gospel of Mark. A deputation of religious officials, Pharisees, had come from Jerusalem to question Jesus about his message and about his fitness to proclaim that message. Taking no notice of Jesus miracles or his teachings, the Pharisees prefer to question him on matters of the Law. Jesus knowing the intent of the Pharisees ignores what is at best a tendentious question and instead gets to the heart of the matter. The question is not about whether fishermen wash their hands, but whether religious officials are right with God even though they follow the outward practices of Judaism scrupulously. This contrived hearing is not about Judge Kavanaugh or even to seek justice (?) for Dr. Ford. Those two human beings are simply collateral damage. The words of Caiaphas, the Jewish High Priest, some two thousand years ago have it just right. I wonder whether Ms. Feinstein had thoughts somewhat like those of Caiaphas when considering whether it was right or fair to spring Ms.Ford’s letter at the last minute in such manner as she did. We all know that the elephant in the Senate Committee’s hearing room is abortion. This contrived hearing is about abortion, about Roe v Wade. The irony is that Senator Feinstein is causing great damage to a woman, a women who may well be in a delicate emotional balance, in order to protect the ability of other women to procure an abortion. 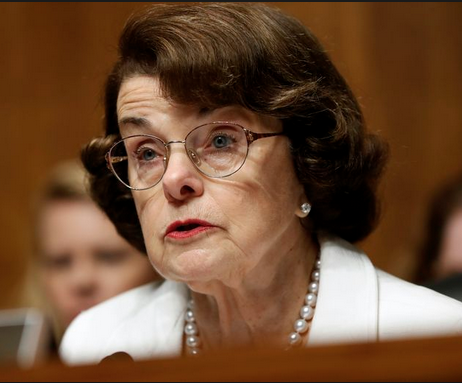 Unlike Caiaphas, Ms. Feinstein was not advocating an actual crucifixion for Ms. Ford, but for Ms. Ford it might have felt little different – now and in the years to come. It is nearing fifty years since Justice Harry Blackmun found the absolute right to abortion in the right of privacy which itself was only to be found in the penumbras of emanations from the Constitution. 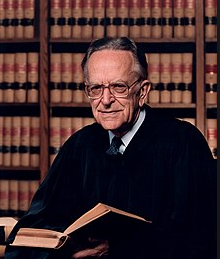 Even Justice Blackmun’s own supporters laughed at the childish reasoning in support of his decision, but he created the absolute right to abort unborn children anywhere, anytime, for any reason. The battle over Supreme Court justices is so bitter and so ruthless because we have abdicated our responsibilities in the matter. The Court makes the hard decisions that we shrink from, the hard decisions we have allowed our elected representatives to shrink from. Fearful men do not like hard decisions. There are no easy answers. Hard decisions are costly. They cost a lot, sometimes everything. Better to let someone else take the heat and make those hard decisions. I know you are being “kind” calling our senators and congress – people “leaders”, but they are far from that, in my opinion. What they did to both of these people lives is despicable. For them to have even allowed what happened last Thursday to go on is bordering on criminal. I am confident that something happened to Ms Ford but I do not believe Brett Kavanaugh had anything to do with any incident with her. Whether she was driven by money, fame, or a horrific event I do not think we will ever know. To do an FBI investigation after allowing her to testify is another travesty of justice, if we even have something like this anymore. Brett Kavanaugh life is ruined and will forever be associated with this mess. Diane Feinstein should be investigated and IF something is found she should be charged with whatever crime that is applicable. This is dirty politics at its worst; no pun intended. Thanks for your insights. Thanks for giving us some deeper insight to all this…. I have wept more this past week than at any time in my years of following politics…maybe it’s my age. Today I wrote my representatives asking them to create a bill that would require anyone running for any office to undergo an FBI check also turn in both your high school and college annuals for thorough examination. Actually…maybe everyone there now should be the examples. I’ve had to shut my tv off! Hizonner Mayor (former) Clint Eastwood is famous for opining that “a man’s gotta know his limitations.” DiFi needs to recognize that hers start with a lack of basic ethics and the sheer meanness of some of her staffers who know they can lead this now weak female senator however they choose. Bill: Very thoughtful commentary, much of which I would agree with. Politics is a dirty but, unfortunately necessary business. What bothers me is that it seems to be getting dirtier. We certainly have had dirty and dusty politicians in the past, but not to the current extent. And like crime and tragedy, the TV media has brought all this dirt into our living rooms. Now we are all too aware of dirty politics. I believe the public image of political candidates is becoming so bad that decent, responsible citizens don’t want to go there. Thus, we are more commonly left with the dregs running for office.